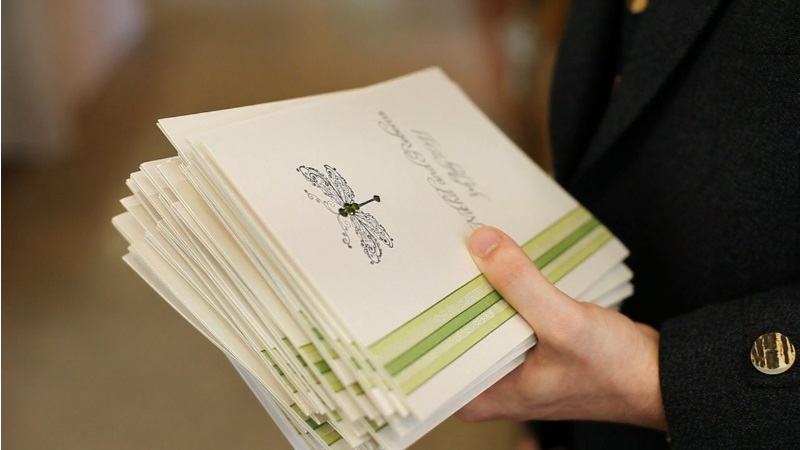 My Mum was always going to make my invites whenever I got married. 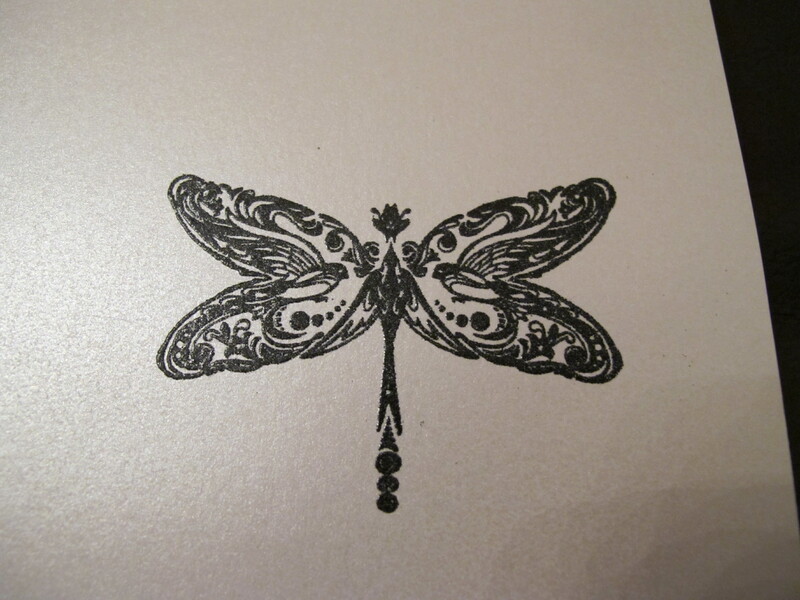 She is amazing at all crafty things and regularly makes cards using all sorts of techniques but mainly using rubber stamps - and she has HUNDREDS! Her craft room (yes it's a whole big amazing room) is stacked with papers, card, pens, embossing powder, other crafty items and many, many stamps. She wanted to get to work right away after we got engaged so as soon as we knew our theme and I had some ideas, we began to think about the design. I had seen an idea involving ribbons in a magazine but adapted it when we found our ribbon in the right colour. 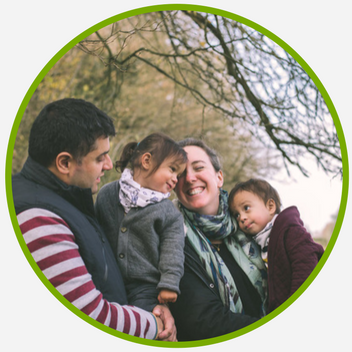 We ended up layering 3 different sizes on top of each other, green, ivory and green again. 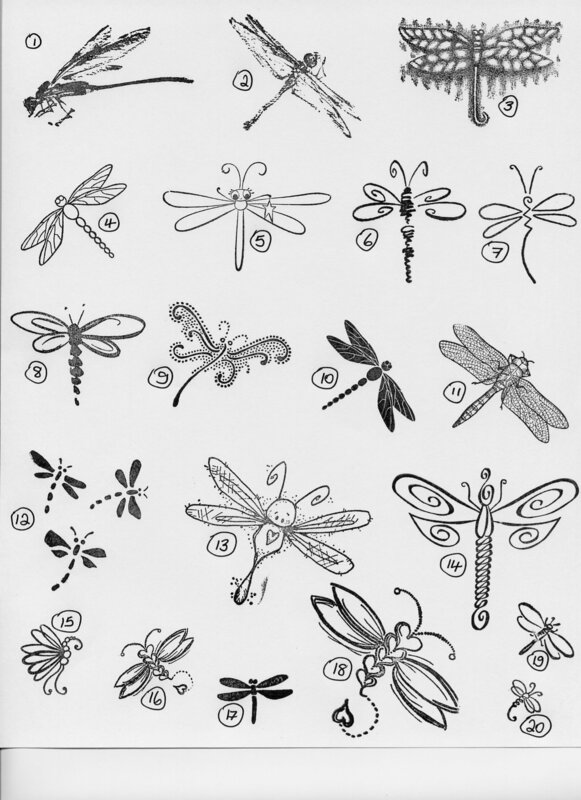 We had decided on dragonflies by this point so Mum sent me a scan of an A4 sheet with all of her dragonfly stamps on it but none of them were quite what I had in mind. We then searched ebay and found a couple of fantastic ones. One of them was a bit more tribal looking with hidden birds, I actually only noticed the 3rd bird after it arrived! 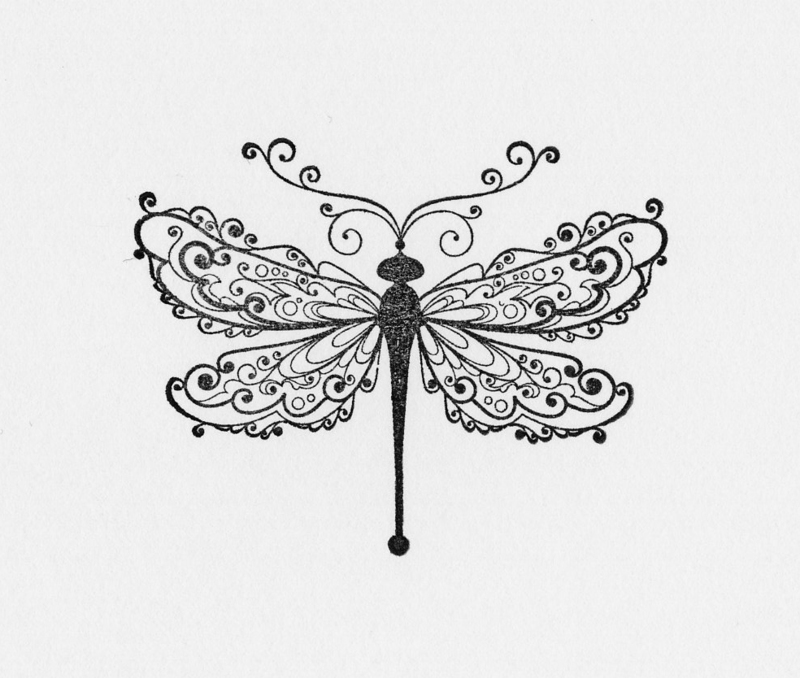 The 2nd one was more lacy looking and had more swirls and loops. 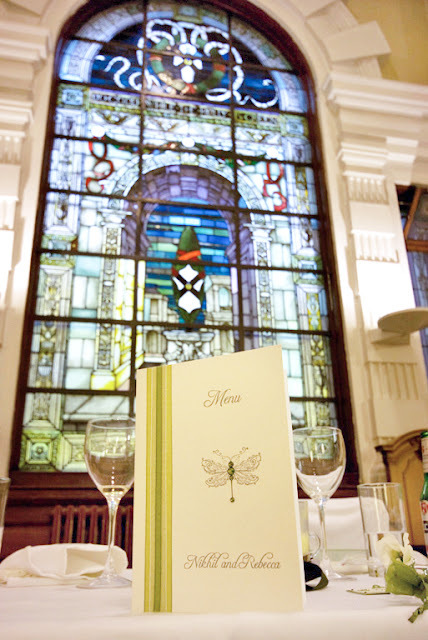 I decided the 2nd one was a bit more 'weddingy' and I'm glad I did as the finished result is amazing! 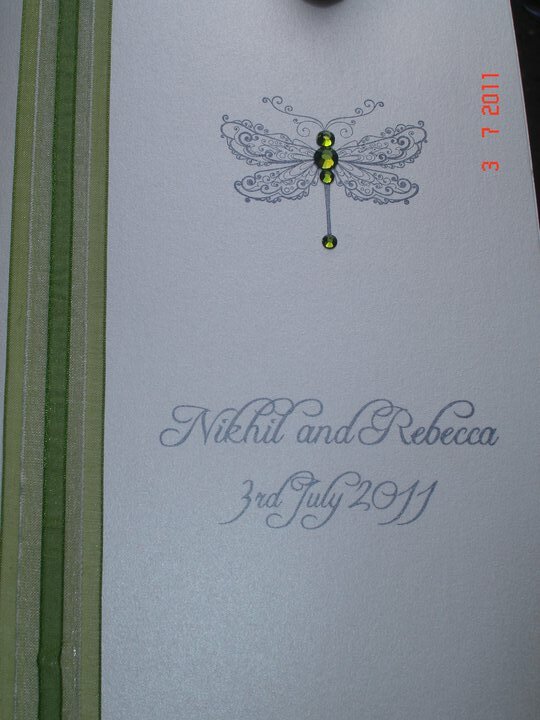 We went for a square invite with the ribbons down the left and the dragonfly on the right with wording underneath. 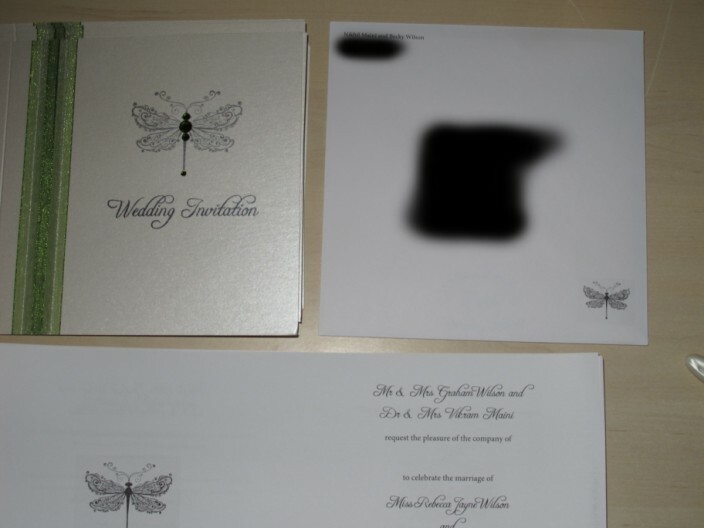 We found a font by searching ebay also for 'Wedding Invitation' and 'Evening Invitation' stamps. We found a nice one on ebay that also told us it was the 'Freebooter Script' font, so we were able to download this and use it on the inserts also. 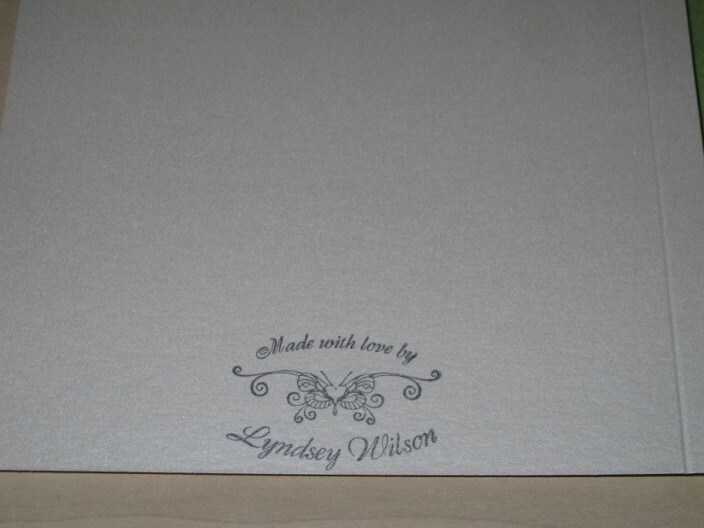 We printed these ourselves with all the extra information and details of our wedding website to give people any other details they might want to know. 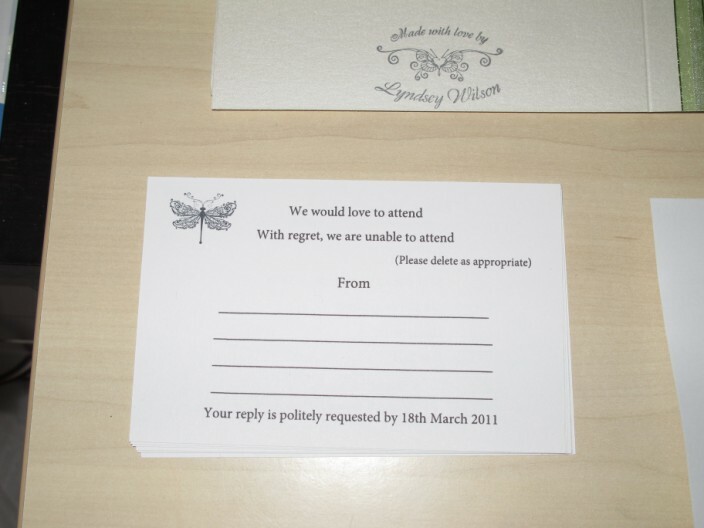 It also allows people to RSVP online which makes my life a lot easier when it comes to the seating plan as I can just drag and drop them into different places and then print. We initially planned to have 3 crystals and then 3 pearls on the ribbons before changing it entirely to have nothing on the ribbons but some green crystals on the dragonfly itself which I much prefer after seeing it done - it totally lifts the whole invite. 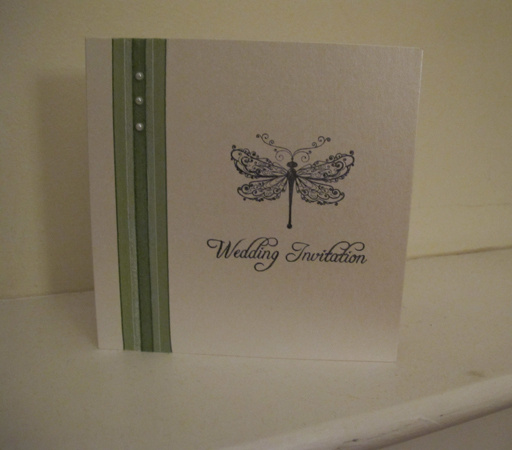 We used the stamped image of the dragonfly to add some detail to our envelopes and RSVP cards. 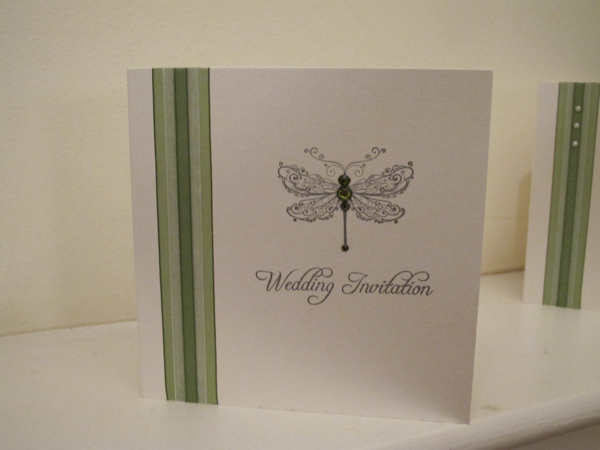 We also included it on our A6 inserts inviting family to an informal BBQ on the Saturday before the wedding. 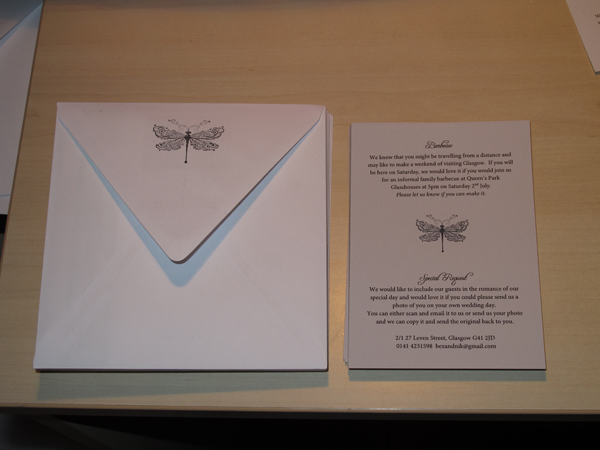 We used the same design for all our stationery - menus and order of service. Mum also made our amazing place names for the jam jar favours.